Prince Creek is a 2700 acre master-planned community nestled in the heart of Murrells Inlet, South Carolina. Located five minutes from the beautiful Atlantic Ocean and only ten miles south of Myrtle Beach, Prince Creek offers a varity of neighborhoods ranging from Intracoastal Waterway communities perfect for boaters, gated communities ideal for those looking for privacy and security, townhome and condo communities for those looking for maintenance free living, a 55+ retirement community, and let's not forget Prince Creek is home to the only TPC golf course in the state of South Carolina. This highly sought after and popular community is sure to offer something for every taste and price range. Prince Creek is also just minutes to restaurants, shopping, hospitals, and the famous Murrells Inlet Marshwalk. No matter which Prince Creek neighborhood you choose to purchase a home in you are assured of first-class amenities. Many of these communities homeowners community pools, tennis courts, fitness centers, & clubhouses. Several of these communities are gated and many also offer boat storage, private boat slips, and so much more! 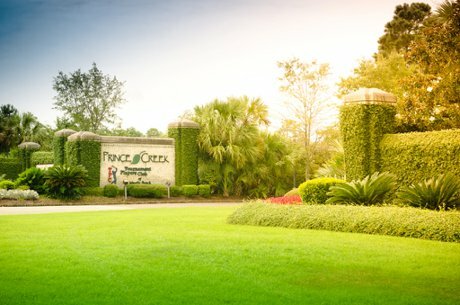 Prince Creek truly is the perfect community for a permanent home, vacation property, or investment. Contact us today at 843-424-6900 for additional information about Prince Creek Homes and Condos For Sale. Also check out other master planned communities along the Grand Strand which include Grande Dunes and Barefoot Resort.